“In the Jewish “Old Testament”, the book of divine justice, there are human beings, things, and speeches in so grand style that Greek and Indian literature have nothing to compare with it. With terror and reverence one stands before these tremendous remnants of what man once was …” Friedrich Nietzsche. Nowhere in the Scriptures is that observation more true than the book of Genesis. In just three chapters, Genesis provides a detailed scientific explanation of the origins of the universe and life, a detailed account of the formation and functioning of the human brain, and a concise exposition of the neurological mechanisms that give rise to human consciousness and human conscience. In just three short chapters, Genesis explains our cosmic origins and our cosmic destiny. Furthermore, these three chapters inform everything else in the Scriptures. In my humble view, a flawed understanding of these few chapters necessarily undermines our understanding of the rest of the Scriptures. For those of an open mind, whether believer or unbeliever, the insights revealed by Genesis can only instill a sense of awe. Verse by verse, even word by word, Genesis unveils the mysteries of the universe. And that is how we will approach the task – line by line, and word by word. The first task is to determine what is meant by “the earth” and “the heaven”. Clearly, therefore, “the earth” in verse 1 does not mean planet Earth, because planet Earth is not “without form and void”; and describing “heaven” with the words “darkness was on the face of the deep”, can’t be a reference to the stars, moon and planets we see in the night sky. These descriptions of “the heaven and the earth” better fit with the current scientific understanding of what matter and space must have looked like before the Big Bang. Scientists, or more properly cosmologists, attribute the ‘beginning’ of the universe to what is called inflation, which they believe led to the Big Bang. The popular television physicist, Michio Kaku, describing the initial sudden inflationary burst, says that “a mysterious antigravity force caused the universe to expand.”  It should be noted that Kaku does not say that inflation ‘created the universe’, but that it “caused the universe to expand.” The universe already existed. What we see from these references is that the universe as we now know it ‘existed’ in a different form before something happened which caused it to ‘transform’ into the present universe. Genesis ascribes the existence of this matter in a preexisting universe to God. Scientists acknowledge that they can at best speculate as to where it came from. The next step is to consider what this dense matter, “the earth”, in the preexisting universe looked like. It’s a beautiful and perceptive description of what scientists today imagine the pre-inflationary universe must have looked like. At this point, verse 2 introduces a literary technique that is repeated throughout the first chapter of Genesis. The condensed pre-inflationary universe of matter and space, referred to in verses 1 as “the heaven and the earth”, are re-described collectively as “the waters”. Water has long been associated with life – life giving and life supporting. In that respect, we should recall what Rees said: “Even if shrunk to a ‘point’, it [matter in the pre-inflationary universe] is LATENT with particles and forces.” What may appear to be empty space, or a primordial plasma, has the “latent” potential to build the universe as we know it, and thus life. Likewise, Michio Kaku asks, “What set off this antigravity force that inflated the universe?” And his answer is that “there are over fifty proposals explaining what turned on inflation and what eventually terminated it.” But, he says, although all physicists don’t agree on how it all happened, most now subscribe to the “core idea of a rapid inflationary period.” (We shall return to the words “turned on” and “terminated” shortly. They are particularly relevant to Day 2). Physicists therefore agree, for the most part, that inflation set the process in motion, leading to the Big Bang and the creation of the universe as we know it; a universe that has spawned life. Genesis ascribes this initial ‘activation’ of “latent” matter that “was without form, and void”, to the “spirit of God”, whereas physicists have no idea how or why it happened. So again, the only difference is in the explanation of how the event happened, not that it did. Even these few verses of Genesis suggest that its author/s must have been aware, to some significant extent, of what scientists today describe as Inflationary Cosmology, which led to what we call expansion. And now, listen to a correct and clear explanation of the text according to its simple understanding (peshuto). The Holy One, blessed be He, created all of the creations from absolute nothingness. And we have no other expression in the Holy Tongue for bringing out something from nothing than “bara” (which is found almost exclusively in this verse). And none of all that which was made – ‘under the sun’ or above – existed [directly] from nothing. Rather, He brought out a very fine element from complete nothingness; it has no substance, but it is the energy that can create, that is able to accept a form and to go from the potential to the actual. And this is the first material [and] is called hyle by the Greeks. And after hyle, He didn’t create anything, but [rather] formed and made [the creations]; since it is from it that He brought everything forth and clothed the forms and refined them. And know that the heavens and all that is in them are one material, and the earth and all that is within it is [another] material; and the Holy One, blessed be He, created both of them from nothing – and the two of them alone were created, and everything was made from them. Nearly one thousand years before modern science proposed the theory of cosmic expansion, a Jewish Scholar studying the Torah described a very similar phenomenon. And as we shall see when we look at Day Two, there is a very good reason for that. On that point, we should mention again the methodology applied in Genesis. As the statement by Nahmanides suggests, Genesis records a consistent pattern of transition of the ‘material’ it starts with, “the heaven and the earth”, through various stages. At each stage, the ‘material’ of the previous stage is invariably re-described before it undergoes its next transition, until the process is complete. And the completed process gives us insight into the purpose of the undertaking. With that in mind, we can move on to the next stage of the process. The next events described by Genesis are so profound in terms of physics and quantum mechanics that it is best to take the next two verses together. We’ll start with the easy part of these verses – “light” and “darkness” – before moving on to the quantum aspects (although they do overlap). The first thing to note is that what was previously described as “the waters”, which was itself a collective description of “the heaven and the earth”, now undergoes a transition to become “light”. But then there is the curious mention of “the darkness”. It hasn’t been mentioned before, and neither is it said to have been ‘created’. God is only recorded as creating “light”. But there is good reason for that omission. In scientific terms, much of what happened “in the beginning” is speculative, but certain assumptions can be drawn by working ‘backwards’, so to speak, and deducing what must have happened to create what we see around us. And that “fireball” created, or released, ‘light’. But ‘light’ in what sense? Well, that is where antimatter comes in. Light is made up of photons which have no mass. They ended up that way because of antimatter. When an electron and an antielectron (called a positron, which is antimatter) collide with each other, they release two photons. Two sub-atomic particles with mass ‘destroy’ each other and in the process convert their joint mass into energy in the form of two photons (mass-less particles of pure energy). So, just after the Big Bang, only one of approximately every 100 billion particles ‘chose’ not to transform into light. The establishment of an “irreversible effect” at certain points in the ‘creation’ process is crucially important to both the Scriptural and scientific accounts of the origins of the universe. As these scientific explanations demonstrate, the direct consequence of the initial inflationary burst, and subsequent Big Bang, was the creation of ‘light’. The fact that other matter, important as it may be to our very existence, was left-over from the creation of ‘light’ appears to scientists to have been entirely coincidental. But it also perfectly explains why there is no mention in Genesis of God creating “the darkness”. That is because “the darkness” refers to the matter that was left over after all the antimatter had been annihilated with matter, of which there was a very slight excess. But it was crucial to our very existence that the ‘creation’ of ‘light’ took place at the precise moment when there was a very slight excess of matter over antimatter; an excess that created the perfect proportion of matter to energy in the universe to facilitate and sustain life. Dark matter and dark energy are also relevant to the reference to “darkness”, but for the sake of brevity, I will not deal with them here (although they are dealt with in the book). So why all this detail about the words “And God said …” and “And God saw …”? The reference to an “outside observer” is crucial because it brings together quantum mechanics (physics) with those curious words in Genesis which refer to God ‘speaking’ and ‘seeing’. To better comprehend the importance of this connection, we need to briefly consider this aspect of quantum physics. There is a two-stage process that determines how fundamental particles transform from a quantum state to a state capable of establishing the physical universe. First, particles are ‘free’ to choose from all probable states. Second, only when a particle is observed will it choose one specific state. However, Kaku says that “physicists realize that if [they] could somehow control these probabilities, one could perform feats indistinguishable from magic.” And this is an important element of the Genesis account of creation. There are also two other aspects of particle behavior we ought to note. The first relates to what are described as delayed-choice experiments. In these experiments, particles are fired through a beam splitter at a detector. When the detector is switched off, the particles show an interference pattern demonstrating that they are in a wave-like mode. However, when the detector is switched on, the particles pass through one or other slit on the splitter and appear as a dot. That means they are in a particle-like mode because they have assumed a specific state after being measured (observed) by the detector. But if the detector is switched off after the particle has been emitted, the particle appears to ‘know’ that the detector will be switched off before it is fired, and adopts a wave-like state. If the detector is programmed to randomly switch on and off as particles are fired at it, the particles always ‘guess’ correctly whether the detector will be switched on or off when they arrive. That conclusion is reinforced by further modifications to the experiments in which an erasing device is placed just in front of the detector which causes the particles to revert to a different mode. But it also suggests that whatever state a particle adopts, by perceiving what the future environment may be, can be undone at any time before the actual observation is made. And that is an important aspect of these experiments, as we shall see. The second aspect of particle behavior we should note relates to what are called Feynman’s “sum over paths” equations. Richard Feynman, another Nobel Prize-winning physicist, demonstrated that although particles are free to choose from all probable paths, the path that leads to the Classical laws of physics is the most probable path. But as Kaku notes, “Feynman showed that the Newtonian (Classical) path is simply the most probable path, not the only path.” Particles are still free to adopt any of the other paths. Now that may all sound like gobbledygook to non-scientists, but all it really means is that we need an explanation of how the uncertainty inherent in quantum physics brought about the predictable, deterministic physical world we see all around us. And such an explanation needs to identify what (or who?) played the role of a conscious outside observer which brought about the transformation from the quantum universe to the Classical universe. We can now consider the relationship between quantum physics and Genesis. The first relates to the words “And God said …” followed by “And God saw …” The former wording (“And God said”) is like the laser, or electron gun, which fires the particles towards the detector. The particles are ‘programmed’, so to speak, by the ‘intention’ expressed in the words which follow the words “And God said …”; that is, “let there be light.” That ‘programming’ enables the particles to ‘predict’ which state they should assume in the expectation of a ‘measurement’. The ‘measurement’, or ‘observation’, is explicitly signified by the words “And God saw …”. The transformed state of the particles is ‘locked in’ once the ‘observation’ is made. That is why we see, at each stage of the process, the intended outcome being repeated. First, in stage one, God is said to ‘direct’ what action is to take place (“And God said, let there be light”); second, the action then takes place (“and there was light”); and finally, in stage two, the action is ‘locked in’ by a ‘measurement’ (“And God saw the light”). And that brings us to verse 5. It seems odd that a ‘day’ would not be described as ‘morning to evening’, but rather that both the “evening” and the “morning” constitute a period of time. But it begins to make sense in the light of Greene’s assessment of the results of the delayed-choice experiments, and particularly the further modification in which an “erasure device” is inserted in front of the detector thus “undoing the past”. The words “And God saw …” are therefore crucial to create an “irreversible effect”, otherwise the initial intention could be undone at any time thereafter. It has the effect of “settling … a consistent and definite history” which is signified by defining the process as “the evening and the morning were the first day.” The final measurement sets the whole process in stone, so to speak. Although this may all seem a little perplexing at first, it is in fact what we do on a regular basis in our own lives. For example, when you decide (make a decision) to go to university to get a degree, you give yourself a kind of instruction as to how you want the immediate future of your life to progress. You then apply, are offered a place, and start your course. At this stage, your objective of getting a degree is not at all ‘settled’. It is only “fully settled”, or achieved, when you sit your final exams, they are marked (‘measured’) and you pass, and are awarded the degree. The awarding of the degree creates “a consistent and definite history” because “the future to which [your initial decision] leads has been fully settled.” Conversely, at any time before you sit your final exams and pass, your objective of getting a degree is not fully settled. Any number of things could intervene to prevent that happening. And if that happens, you revert to the original position of having to decide (make a decision) on what to do next. Your past (decision) is “undone.” Like the particle in a wave-like mode, an “interference pattern” again appears in your life. Our lives are generally segmented into just such sets of objectives that we work to achieve. Each segment is like the “days” described in Genesis, including the “seventh day” when God is said to have rested from all His work. We humans retire – if we live long enough. This ‘naming’ of what God is said to have created clearly symbolizes “how the fundamental laws of quantum physics morph into the classical laws that are so successful at explaining common experience – in essence, [it demonstrates] … how the atomic and subatomic shed their magical weirdness when they combine to form macroscopic objects.” It demonstrates how the phenomena of the micro-world combine to form the objects that make up our every-day reality. It should be noted that this ‘naming’ uses capital letters – “Day” and “Night”. And this ‘naming’ only occurs on two other occasions in the Genesis’ account of creation, at verses 8 and 10. As we shall see in subsequent articles, these instances also relate to the transition of matter from one form to another. This ‘naming’ is clearly to emphasize that a transition has occurred from the quantum state of affairs to a Classical state of affairs, which gives the foundation for the deterministic, predictable universe which was a pre-requisite for the emergence of life. 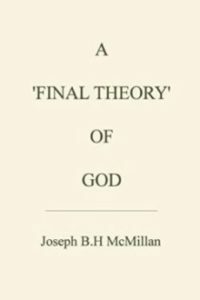 We have already seen that the words “And God saw the light” was the first step in ‘creating’ the kind of universe that “our very existence depends on” by ensuring “an irreversible effect that established an excess of matter over antimatter.” It established the predictable physical basis on which to build a universe that could spawn and sustain life. It transformed the ‘chaotic’ pre-inflationary world of quantum physics into the predictable, ordered world of Classical physics. Locking in the “light” at just the right moment to ensure that there would be enough matter left over to create a life-sustaining universe was “good”. Imposing order on chaos was “good”. The ‘freedom’ enjoyed by particles in the quantum world was subjected to a system of law. But Day One was only the first step in establishing a universal system of law; a system of law that, in the end, manifests itself as a human organism endowed with a capacity for moral judgment, yet free to choose whether to exercise that judgment. The next article addresses Genesis Day Two, and the concept of Expansion. Joseph BH McMillan. This article is an abridged extract from A ‘Final Theory’ of God. Nietzsche, Friedrich. Beyond Good and Evil, Vintage, New York, 1989, para 52. Green, Brian. The Fabric of the Universe, Penguin, London, 2005 (paperback), page 318. Rees, Martin. Just Six Numbers, Phoenix, London, 1999 (paperback), page 126 – capitals my emphasis. Kaku, Michio. Parallel Worlds, Penguin, London, 2006 (paperback), page 13. Cox and Forshaw, Why does E = mc2?, De Capo Press, Cambridge, Mass. 2001 (paperback), page 200. Cox and Forshaw, page 200. Rees, page 154 – my emphasis on ‘irreversible’. Weinberg, Steven. Dreams of a Final Theory, Vintage, New York, 1994 (paperback), page 85 – my emphasis. Greene, pages 82 – 83. Pingback: Is Islam "unoriginal and decadent"?